Three first half goals from Derry City saw them blitz St Patrick’s Athletic at Richmond Park to make it four straight league wins. Patrick McClean, Gerardo Bruna and Junior Ogedi-Uzokwe got the goals for the Candystripes as the hosts finished with 10 men. The deserved victory, Derry’s fifth on the spin in all competition, moves them second in the SSEW Airtricity League Premier Division and now sets up nicely the visit of leaders Shamrock Rovers to the Brandywell on Friday night. With perhaps one eye on that big home clash to come, Derry boss Declan Devine made three changes from last Friday’s 2-0 win at UCD, the most notable benching captain Barry McNamee. St Pat’s made just one enforced switch from their 1-1 draw at Cork City with Ciaran Kelly coming in for the suspended Dave Webster. The in-form Candystripes started on the front foot and stunned the home crowd to take the lead inside two minutes. There appeared little danger when Greg Sloggett laid the ball off to McClean. The Derry left-back had other ideas as he struck a dipping left-foot shot that seemed to deceive St Pat’s keeper Brendan Clarke as it squirmed under him into the far corner of the net for McClean's second goal for his home town club. Struggling to get ball off Derry, it was 15 minutes before the home side threatened. The nimble feet of Darragh Markey worked a one-two with Rhys McCabe to get in behind the Derry rearguard. The little midfielder’s shot lacked power, though, as Peter Cherrie comfortably gathered. But two minutes of St Pat’s indiscipline turned the game further in Derry’s favour. First, an 18th minute foul on Darren Cole brought a free kick some 25 yards out with the visitors taking full advantage to double their lead. Argentinian Bruna whipped a direct strike up and over the wall and into the bottom left corner of Clarke’s net. And it got worse for St Pat’s just one minute later. Defender Kevin Toner recklessly lunged into Derry skipper Ciaron Harkin on the halfway line. Donegal referee Paul McLaughlin didn’t hesitate in brandishing a straight red card. Continuing to pass the ball well, Derry extended their lead further on the half hour. Cole’s flighted cross from the right found Ogedi-Uzokwe who swept the ball home for his first league goal for the club. Dispirited St Pat’s needed a response and got it within two minutes, Gary Shaw meeting a Simon Madden diagonal ball from the right to glance a diving header past Cherrie to the net. 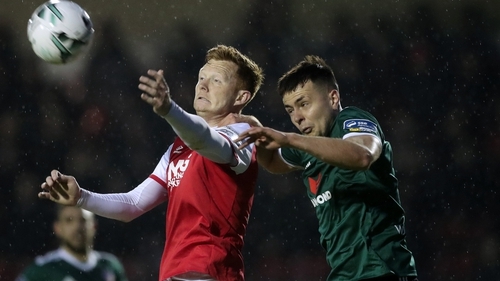 But the irreversible damage had been done in the first half for Harry Kenny’s Saints as Derry now look forward to the visit of Shamrock Rovers on Friday with a spring in their step. St Patrick’s Athletic: Brendan Clarke; Lee Desmond, Kevin Toner, Ciaran Kelly; Simon Madden, Rhys McCabe (Cian Coleman half-time), Jamie Lennon (Dean Clarke 76), Conor Clifford, Ian Bermingham; Darragh Markey (Jake Walker 80); Gary Shaw. Derry City: Peter Cherrie; Darren Cole, Josh Kerr (Eoin Toal 88), Ally Gilchrist, Patrick McClean; Ciarn Harkin, Gerardo Bruna (Barry McNamee 71); Eoghan Stokes (Ciaran Coll 66), Greg Sloggett, Junior Ogedi-Uzokwe; David Parkhouse.